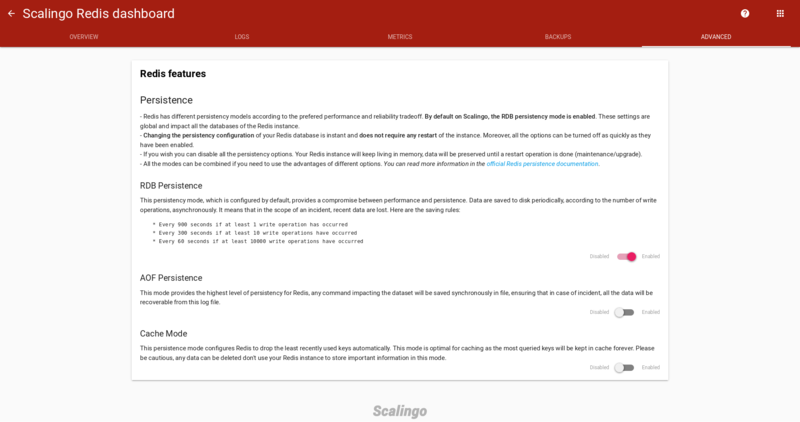 Scalingo’s Redis as a Service offer got a few new configuration options. You can now control the persistence and cache modes of your databases. This article will guide you through the different persistence modes and give relevant examples for each of them. Redis is a high performance key value database. Its specificity is to store all the data in RAM to prevent slow disk accesses. The con of such way of operating is that the RAM is volatile and you might suffer data loss in case of an incident on the Redis process or its host. To prevent important data loss, Redis offers a couple of ways to persist data on disk. There are two persistence modes: snapshot mode and strong persistence. They both represent a different trade-off in terms of performance and reliability. As such, choosing Redis persistence mode settings is a strategic decision developers have to make. For a long time, Scalingo chose a default persistence model that you could not configure. That’s a thing of the past! The second mode provides Redis with the highest level of persistence (also called AOF). Any command impacting the dataset will be saved synchronously in a file. In case of incident, Redis replays the logged operations to reconstruct the database dataset. The typical use case is when using Redis as a key-value store. We can imagine the comments on a blog post page being stored in a Redis list. Losing comments because of an unexpected Redis restart is not acceptable and activating AOF mode sounds like a good idea. OK, so which persistence mode should I use? If your target is the same kind of data safety provided by your typical SQL database, you should use both AOF and RDB. If you care a lot about your data, but still can live with a few minutes of data loss in case of disasters, you can simply use RDB alone, you’ll get better performance. Whatever is the configuration you choose, backups triggered by our system are generating a RDB snapshot of the database remotely, the snapshot is directly streamed to our backup controllers which encrypt and archive them. The last available configuration is related to how long data are stored in Redis. When cache mode is activated, if the memory is full, Redis will automatically drop the least used data to free up memory for most recent data. Be cautious as any data can be deleted. Don’t use your Redis instance to store important information in this mode. The typical use case is Scalingo’s homepage and blog you’re browsing right now. It uses Redis as a cache for HTML fragments. In such case, we can afford using the oldest data stored in Redis, and re-compute them if needed. maxmemory: Amount of data redis accepts before dropping some of them. It is set at the value of the memory available of the database plan you’ve chosen. maxmemory-policy: Set at allkeys-lru, which means ‘Least Recently Used’ keys will be evicted first if the maxmemory amount is reached. Modifying these parameters on a Scalingo hosted Redis database is as simple as going to the “Advanced” tab of your database dashboard. Just click on the toggle button to modify the setting. The setting is automatically applied and does not require a restart of the database.